The main consideration when hiking in the mountains is safety. I have really only found myself in a dangerous situation one time in the Sandia Mountains. However, you should always be aware that you are entering a wilderness area. The mountains and the elements can be very unforgiving of mistakes. You need to prepare accordingly. The following paragraphs list some essential and recommended things that you can bring along on your hike to make your day more enjoyable and safer. I always carry a day pack (small backpack) whenever I hike. When hiking to remote portions of the mountain, you need to be prepared for an unexpected overnight stay if worst comes to worst. A fall, broken bone, or other injury may prevent you from hiking out on your own. You need to be prepared to stay dry and warm in case you have to be out in the elements overnight until help arrives. The odds are that you will never have such an emergency. But unless you prepare for one, a bad situation could quickly escalate into a life threatening one. Thus, I have my day pack full of the items listed below. Although it seems like a lot of preparation, I now just leave it packed from week to week, and know that it is ready to go anytime that I head out the door. I carry supplies, such as: a flashlight, extra batteries, Band-Aids, matches, squares of newspaper, cigarette lighter, a whistle, twine / strong cord, and a small first aid kit. In addition, I carry: a compass, sunscreen, a windbreaker, a mirror, pocket knife, rain poncho, a couple of plastic trash bags, and an extra set of car keys. I will probably never have to use most of these things, but I'd rather have it and not need it, than (you know the rest). Always carry plenty of water on any hike. I usually take between 2 or 3 liters of water on any hike. I sometimes fill a water bottle one quarter of the way, and put it in the freezer the night before. I can fill it the rest of the way with water right before the hike, and have cold water for the whole hike. You should not consider any water sources in the Sandia Mountains to be drinkable without appropriate chemical treatment or filtration. I always carry a lunch or supply of snacks to enjoy along the way. If you end up having to spend a night on the mountains, a supply of extra food will help keep your energy up. The standard advice is to dress in layers. Be sure that you have the clothes you need to keep warm. You can always peel-off layers and stuff them in your day pack as you get warmer. Temperatures at the top of the mountain when the sun is waning, might be 20 degrees cooler than when you started on a hike. So be prepared for a range of temperatures on any given day. I would recommend that you always wear a hat to protect your face from the rays of the sun, as well as to keep your head cooler when its hot, and warmer when its cold. Be very cautious of hiking into snow. From November through April some portions of the mountain, especially upper La Luz Trail, are impassible due to snow coverage. Do not try to hike through deep snow (higher than your knee) when dressed in a light jacket, jeans, and tennis shoes. Incredibly, many people do, and run severe risk of hypothermia (or even death). If you run into such snow and are unprepared for it, simply turn-around and hike back to your car. Please be a good citizen of the mountains, and leave them as beautiful as you found them. This includes packing out all trash, cans, food, and paper that you have brought into the wilderness. Do not take "short-cuts" across switchbacks, which cause errosion to the trails. Although not absolutely necessary, I recommend hiking in a good pair of hiking boots. Many, if not most, of the trails can be very rocky, uneven, and sometimes slick. Hiking boots will protect your feet and give you much better footing. A good pair of hiking boots will also protect you from a turned ankle. You do not want to get 5 miles from the nearest trailhead and come up with a sprained ankle as the sun starts sinking in the sky. My recommendation is not to hike alone in the mountains. Not only will you enjoy the companionship and sharing the outdoor experience if you hike with a friend, but in case of emergency you (or your partner) can always go for help. Taking a cell phone to the mountains is somewhat controversial these days. I believe that leaving the cell phone on, and taking calls from the family about soccer practice or what's for dinner will lessen your get-away experience. However, I am a realist and know that those calls can be important for many people. But, most importantly I think that a cell phone may one day prove invaluable in an emergency to summon help for a lost or injured hiker. If you have a cell phone, I say take it along for a safety backup. A very good map of the mountains and almost all of the trails is produced by the US Forest Service. 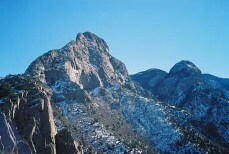 It is entitled "Sandia Mountain Wilderness." It is printed on water-resistant paper, and is very rugged. This map is sold at the larger bookstores and sporting-goods stores in Albuquerque, and is also available at the Sandia Ranger District Office in Tijeras. It is a good idea to learn to read this contour map, and to always have a good idea where you are on the mountain as you hike along the trails. I keep a map in my hip pocket while hiking, and refer to it along the way. There is a fee to park at many of the trailhead parking areas in the Sandia Mountain Wilderness. The fee is $3 per vehicle per day. If you plan to do much hiking, consider purchasing a parking pass. The price is $30 for a one year pass. If you have two vehicles in your household, the pass is good for both. These passes can be purchased at the Sandia Ranger District office in Tijeras (phone: 505-281-3304), or at REI, 1550 Mercantile NE (I-25 and Montano, phone:247-1191). There is also a fee to park at the Ellena Gallegos Open Space, run by the city of Albuquerque. The fee is $1 on weekdays, and $2 on weekends. An annual parking pass may be purchased for $26.40, if you plan on visiting this area often. It is unlikely that will get really lost in the Sandia Mountains. However, it is easy to wander off some of the lesser used trails. As you are hiking it is always a good idea to pay attention that you are still on the main trail. There are numerous "user paths" criss-crossing the trails, and it is easy to walk off of the trail and end up at an obvious deadend. If this should happen, try to retrace your steps until you are sure that you have gotten back to the original trail that you intended. If you should become genuinely lost, you have two good choices. If you have a general idea where you are, which you should from the map that you have taken along, you may be able to hike-out to the nearest road (using a compass to provide a general heading). Generally if you walk down hill in the Sandia Mountains, you will reach help within a few miles. However, if this looks dangerous because of the terrain or you are not physically able to attempt the hike out, then just stay right where you are. No matter where you are on the mountain, a search and rescue team will be able to find you. However, the closer you are to an established trail, the quicker the help will arrive. I have suggested a number of items to carry in your backpack (including a whistle to signal your location) to help in the event that you are waiting for help to come.